Compare 64 Samsung Galaxy Note II (White) pay monthly contract mobile phone deals. 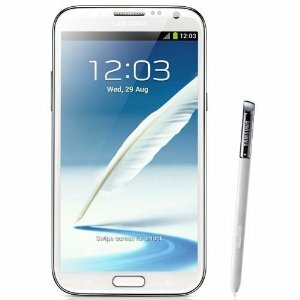 The Samsung Galaxy Note II continues the large screen and stylus pairing with a stunning 5.5 inch Super AMOLED display and a newly improved S Pen. The screen has a ratio of 16:9 and a 1280x720 resolution making this a superb phone for watching movies or web browsing. The 1.6GHz quad-core processor and 2GB RAM ensures no matter how data hungry the visuals are, the Galaxy Note II can handle tasks with ease. The S Pen gives users a fantastic input method with a natural ergonomic design and a nifty eraser on the end so you simply switch the pen round to erase any mistakes. Additional features of the stylus include Air View that previews messages and videos by simply hovering the pen over them or Quick Command that is a simple gesture to open your favourite most used apps. The 8 megapixel camera includes image stabilisation, touch focus and face and smile detection as well as HD video recording at 1080p. 4G, HSDPA, Wi-Fi, Bluetooth and GPS are all on board as well as NFC and DLNA ensuring there is no end to the connection options. Multimedia is fantastic on this phone thanks to the stunning screen and the Android 4.1 OS delivers a number of pre-loaded apps as well as access to the Google Play Store. No one has yet rated the Samsung Galaxy Note II (White). Click the link above and score it out of 5 based on how awesome you think it is. You can also leave a few comments or write your own review.